The unique engineering principles adopted in the design of Metrail rolling stock bring significant cost and environmental benefits. The advanced electric drive train with its on–board power supply eliminates the need for the traditional live third rail or overhead power lines (catenary). The benefits from reduced build time and disruption are immediately apparent. Metrail’s lighter, self–powered carriages mean the guideway can be of a simpler design with no electrical infrastructure. 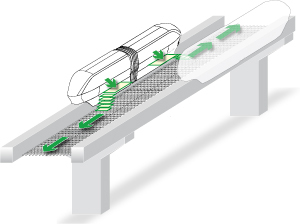 The Metrail system is far safer for both operator and passengers as the traction system operates at low voltage and the guideway incorporates a central evacuation walkway. 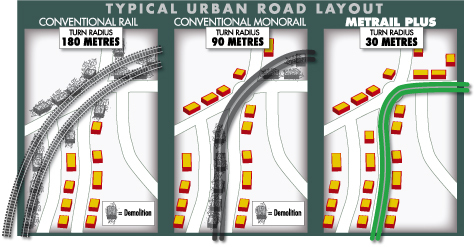 Metrail’s unique multiple steering system allows a turn radius below 30 metres, allowing mass–transit networks in locations previously impossible to achieve with conventional rail or other monorail types. A Transponder readers on each bogie. Speed and position are also calculated from motor sensors. 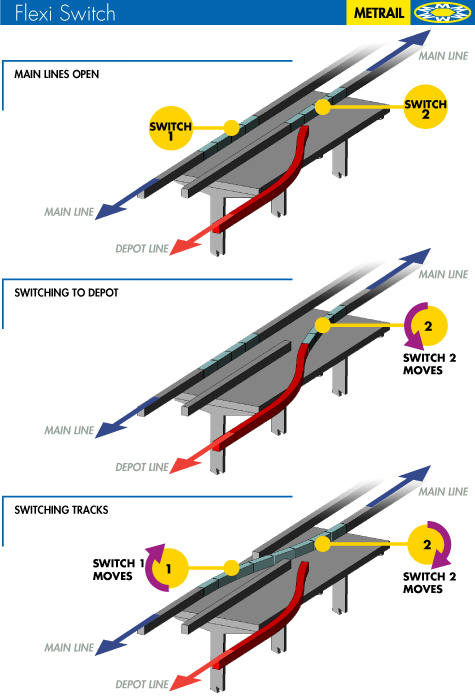 B Uniquely coded Passive Transponders are embedded in the track at regular intervals and sensed by readers (A) on each bogie. No trackside wiring required. 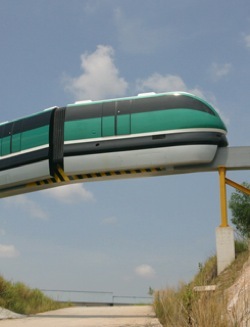 The Metrail system builds on the unparalleled safety record of straddle–beam monorails. Central walkway allows full safety and maintenance access. 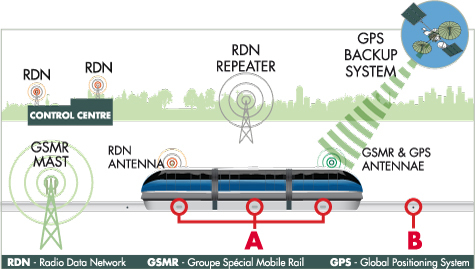 Metrail is fully supported with all the necessary safety systems for full network implementation, such as signalling, ATC, ATP and communications. Zero straddle–beam monorail passenger fatalities in over 100 years use. All Metrail safety systems conform to the latest international standards and feature multiple redundancy for failsafe operation.